When a company culture is strong, performance is consistent from management quality to customer experience. Why? Because in a strong culture, we know exactly what to do, even when “the boss” isn’t around to tell us. It creates a sense of belonging, purpose and pride that can only boost everyone’s ability to give their best every single day. For most of my career, I’ve been on a journey to define and then deconstruct company culture and I think I’ve come up with a few insights that just may help you strengthen yours. 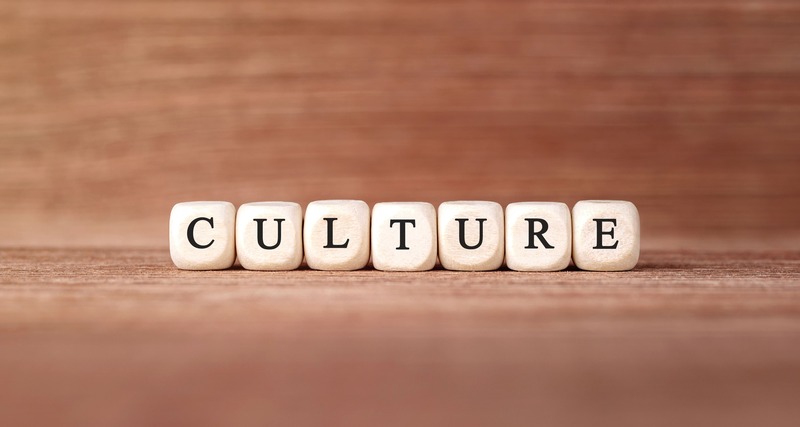 Culture is a conversation, led by leaders, about “how we do things here successfully, and why we do what we do.” It’s reinforced with symbols, rituals and most of all, action. In other words, culture is a set of beliefs that reinforce best practices and define what “is not acceptable here.” Humans like predictability, and that’s why a strong culture is a magnet for talent. So how can we amplify and then punctuate that cultural conversation? It starts with defining the core values that differentiate your company and energize your team. Sometimes they were laid down early on, and in many cases, you’ll need to collaborate with the current team to come up with ones that are relevant to the times. You need to then apply those core values to best-practices in order to translate them into action-code. Think: Operating system for a computer. 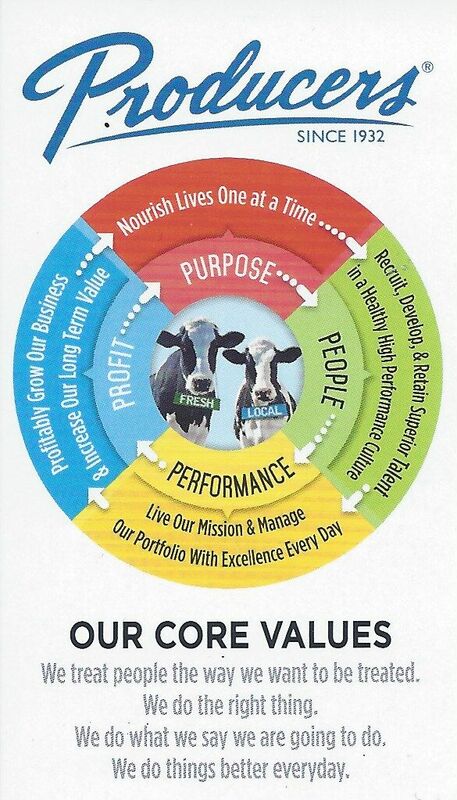 Here’s an example: Recently I met a leader from Producers Dairy at a conference where I presented. He shared a business card sized placard that summarized both the values as well as an action-wheel around their four drivers: Purpose, People, Performance, Profit. 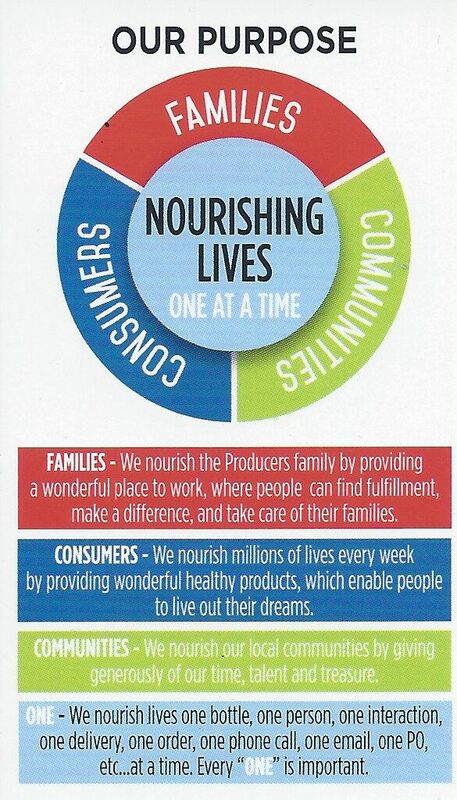 I really like how they expanded on Purpose as the key cornerstone of what drives them every day. In some cases, you just need crisp examples of best-practices that demonstrate living your core values. Once you identify them, make sure and share them often. Remember, culture is a conversation, which is ongoing. Great leaders build culture by talking about every single day. For more of my insights on building a great culture, watch this short video that captures me in conversation with Saint Louis based business owners.